Often, girls with long hair have problem of split ends ( last 2-3 cm of their hair is usually affected), but they usually don’t want to trim their locks, because they don’t want to lose those vital centimeters of their beautiful hair. So what’s the solution? One easy way to get rid of natural hair split ends is to trim them every 6-8 months to keep hair ends healthy. The longer you wait the greater the probability of your split ends worsening and moving up the hair shaft. Even if you’ve a long hair, just one inch cut will be effective as splits are mostly found at lower end hair shaft points and not just visible at tips of your impaired hair strands. In fact, if you really want to grow healthier, longer hair, go for regular trims. There’s no need to shampoo more often than you what you need to. Go for alternate day cleansing unless you have super oily hair. It’s best to use mild or herbal shampoo for split ends while washing your hair. Also, it’s a good idea to use shampoo with sun-screen. Mostly split ends are due to dandruff and brittle hair. You can also use anti-dandruff shampoo as it also contributes to repair split ends. Once your dandruff is cured, it will automatically lead to repairing your split ends. You can use a leave in condition after every shower as it prevents drying out hair and prevents split-ends as well. Conditioners that are rinsed out in the shower do little to nothing to prevent occurrence of split ends. It’s important to deep condition your hair. If your hair has dried due to excessive heat styling or are naturally super dry, such dryness can cause split ends. Consider fortnightly or weekly deep conditioning treatment to moisturize your hair to get rid of your split ends. Mix 3 tablespoons of olive oil with one table spoon of coconut oil. Add one ripe mashed avocado. Mix well all these ingredients, until you get a creamy consistency. Apply this hair mask for split ends, avoiding the roots. You need to concentrate on the middle length and up to the ends of your hair. Now make a hair bun and cover up your head with a shower cup, or towel. Allow this mask to sit for at least an hour. Wash and condition your hair as usual. You’ll notice great results from the first time of using this hair mask. Your hair will become softer, shinier, and healthier. You need just one cup of flat beer. Simply pour beer into a spray bottle and spray evenly over your hair. Leave just for an hour and then rinse it thoroughly and then wash with a mild herbal shampoo for split ends. The sugar and proteins in beer bonds to your hair and strengthen and mend damaged follicles. The only inconvenience of this interesting hair treatment is the beer scent, but if you can easily bear with it – try this method! It really works! There’s another interesting hair mask for split ends. Mix one avocado, 3 tablespoons of olive oil, and 2 tablespoons of egg whites, whip till creamy. Now gently apply this mixture all over your hair and leave for at least 50 minutes, then wash hair using a mild shampoo. This mask works because olive oil provides the incredibly moisturizing boot to damaged, dry tresses, avocadoes are full of vitamins and other vital nutrients, and egg whites are full of vital hair follicle nourishing proteins. Because prevention is MUCH better than cure… ! Heat is the biggest cause of split ends as it drastically reduced natural moisture balance of your hair. It also temporarily alters the hair’s protein structure, which leads to physical trauma. So avoid using heated tools like blow dryers and flat irons. If you need hair styling, first spray your hair with a thermal protectant to prevent split ends. Various chemical processes such as highlights, color, perms and straightening causes trauma that can break down the cuticle. 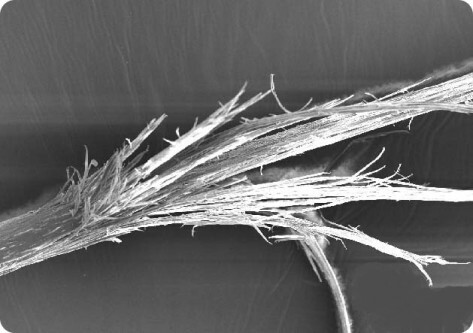 Once cuticle is weakened, split ends are bound to appear. So try to limit chemical treatments and refrain from washing strands 48 hours afterwards, because its when they are most porous and are likely to break and split. Deep condition by using hydrating products is best for split end preventing. These types of products lubricate hair fiber and keep it supple and soft. They also shield hair from harsh sun and various other environmental stressors like humidity and wind. Eat leafy veggies, soybeans, oranges and wheat as they supply ample folic acid. You can get biotin from lentils, brown rice, sunflower seeds, peas, soybeans and walnuts. It strengthens both your nails and ahir through metabolism of carbs, fats and proteins. And finally, remember, if you really want to have beautiful, shiny and healthy hair without split ends you need to take a good care of your locks, eat healthy food, nourish and protect your hair from excessive sun exposure.